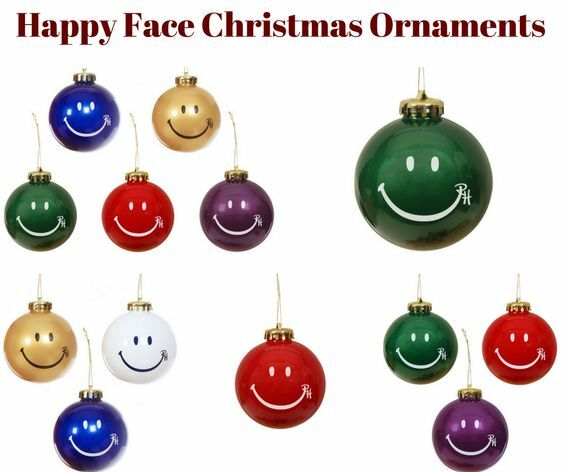 These Happy Face Christmas Ornaments by Ron Herman will put a smile on your face! A Ron Herman Exclusive / Designed For and Exclusively Available at Ron Herman. Entire Set 6 of Classic ball plastic ornaments with signature Ron Herman Happy Face logo on front. Set includes a white, a gold, a blue, a red, a purple and a green RH Happy Face ornament. Gold color top with gold hanging string. Each ornament Measures 10″ in diameter and comes individually packaged in a white ornament box. A Ron Herman Exclusive / Designed For and Exclusively Available at Ron Herman. Set of three classic ball plastic ornaments with signature the Ron Herman Happy Face Logo on the front. Pack includes one red ornament, one green ornament, one purple ornament. Gold color top with gold hanging string. Each Ornament measures 10″ diameter and comes individually packaged in a white box. Set of three classic ball plastic ornaments with signature the Ron Herman Happy Face Logo on the front. Pack inclused one gold ornament, one white ornament, one blue ornament. Gold color top with gold hanging string. Each Ornament measures 10″ diameter and comes individually packaged in a white box. A Ron Herman Exclusive / Designed For and Exclusively Available at Ron Herman. Classic ball plastic ornament with signature Ron Herman Happy Face logo on front. Gold color top with gold hanging string. Measures 10″ in diameter. Each ornament comes individually packaged in a white ornament box.